Dr Henry Newman graduated from the University of New South Wales and completed his cardiology training at the Royal Prince Alfred Hospital in 1981. His postgraduate cardiology studies at the Hammersmith Hospital in London led to a number of publications in the field of hypertrophic cardiomyopathy. Qualifications: MBBS. FRACP. DDU. FCSANZ. FACC. 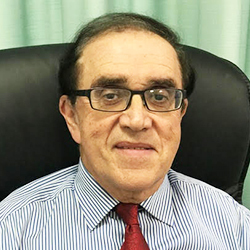 In 1984, he was appointed as a General Physician/Cardiologist to Liverpool Hospital and commenced private practice in Liverpool. In the years to come, he was joined by Dr David Taylor and Associate Professor Rohan Rajaratnam and the practice expanded to include rooms in Campbelltown and Camden. Dr Newman is a Member of the Cardiac Society of Australia and New Zealand, Royal Australian College of Physicians and the American College of Cardiology. He has admitting rights to Liverpool Hospital, Sydney Southwest Private Hospital, Strathfield Private Hospital and Prince of Wales Private Hospital. He can speak fluent Polish and communicates in Russian, German and Czech. Special interest in cardiology: heart failure, hypertension, diagnosis of chest pain, preventative cardiology, hypertrophic cardiomyopathy, risk factor modification, non-invasive investigations including echocardiography and stress echocardiography. Special interests outside cardiology: Jazz, classical music and fine arts.